Many eco-friendly designs can, and often do, sacrifice functionality for form or require higher costs. In every eco-conscious design there is the tension of these two aspects and an imbalance in either direction can bring with it a negative consequence. Homeowners and designers are generally more concerned with how the space looks rather than how it lives or affects the overall environment. They don’t realize that a home can be functionally elegant with formal finishes and still meet the needs of day-to-day living while helping our planet. There are many elements that make up a classic, comfortable, and cost-effective green design. We will address several in this article. Function and design don’t have to be in conflict. When the function drives the design, the result can be warm and homey as opposed to cold and showplace. “Formal” may mean one thing to one person and something else to another, but it is most important to be able to live comfortably in your home while feeling proud of your design. You don’t have to live in the woods or a hippy commune to go greener. While larger choices are a great step, smaller changes can be just as effective- and just as functional. Brighter the space with natural light by adding windows or leaving uncovered the ones you already have. Focus on the simplicity of your space. Usually simple means more functional- and less hassle. A lot of homeowners and apartment dwellers think they need lots of space to have a formal living area. This is not true. Big is not necessarily better. The use of wainscoting, moldings and boxed beam ceilings can create a luxurious feel without being stuffy and does not require large, expansive rooms. These small details are also a great way to incorporate eco-friendly ideas and materials. Re-purposed wood can be found several places, and is a beautiful material that requires little transformation. Bring the outdoors, in! Natural materials are amazing to work with, and most often some of the most sustainable available. Whether the space is large or small, there’s no time to waste time, energy, or money. The objective is to build with simple techniques that don’t further pollute the environment. And today’s options make that easier than ever! A consideration in decorating should include the exterior theme of the living unit. Most home styles such as Craftsman, Victorian, Traditional, Contemporary, Southwestern Santa Fe or Southern Colonial can be decorated to reflect a formal design. The continuous flow of the style inside and out far outweighs the scattering of different themes throughout the home. Painted details rather than natural wood typically evoke more of a formal feel, but both can be used in most styles. When renovating a room, look for less-toxic paints or stains. Ideally, you’ll want to use paints that meet low VOC’s (volatile organic compounds), low biocides, and natural pigments. This will protect you and your family, while also protecting Mother Earth! The type of flooring you choose will also have an affect on the form and functionality of the space. Carpeting can be formal or casual, but what type fits your family needs and your eco-friendly stance? Hardwood is popular and again, depending on the color and type, it can go either direction. You may love marble, but does it make sense for you? Choose floor coverings that not only look nice, but also work for your family with consideration of sound, durability, and ease of maintenance. Bamboo, Glass, recycled metal, cork, or cement. Flooring is one area where eco-friendly materials are endless! Have fun searching for what fits your modern design. The choice of window coverings in a room that gets a lot of natural light would be more formal with drapes rather than shutters. However, if you have a lovely view out your window, you wouldn’t want to cover it up completely so you should choose a soft covering rather than a hard surface to keep it more in line with the formal look and yet not distract from your view. Use materials that breathe. Embrace the natural light. Green design starts with appreciating what Mother Nature has already provided us. Regardless of what theme enhances your home, the appropriate design and use of products must reflect your desired lifestyle in order for it to have a successful formal design with full functionality. 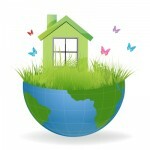 Go into a renovation with your eco-friendly feelers out and your core beliefs held close. Eco-friendly design is a wonderful thing. Embrace it! Kelli McDonald is a blogger and writer for all things interior design. She also works for LuxeYard and their group discount furniture offers.